One of the primary motivators for my baking is because buying dessert everyday is too expensive. Yes, I crave sweets everyday, and most often of the pastry variety. Chocolate bars and candies don’t satisfy me. I was examining my Mint budget for the month of October, and was shocked at how much of it went to buying random snacks to tide over an afternoon lull. This must stop! 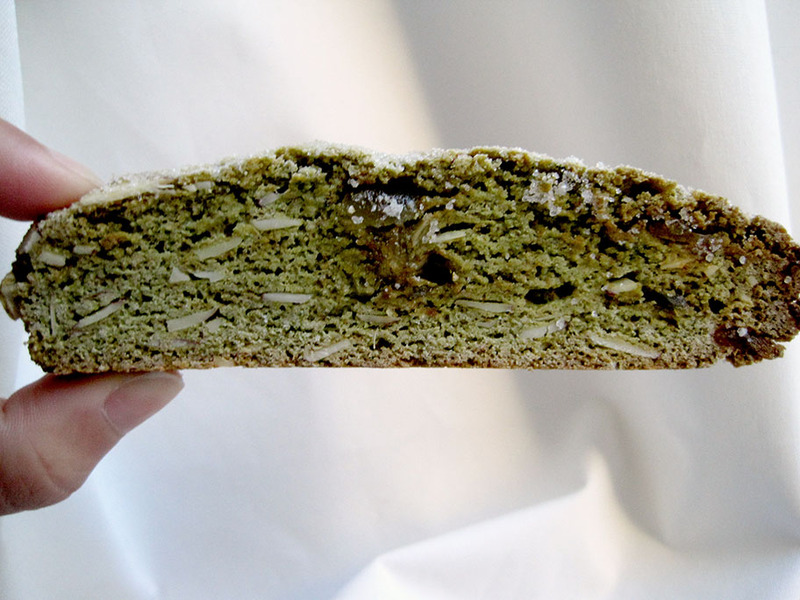 Enter the matcha, ginger, and almond biscotti. I had crystallized ginger from an oatmeal, white chocolate and ginger cookie recipe, and I had matcha powder from a previous iteration of a green tea shortbread cookie. I also had slivered almonds from a chocolate granola recipe – triple win! Efficient, and makes good use of existing ingredients I have in my pantry. Biscotti is cool because it’s a double-baked cookie. First it is shaped into a flat loaf and then baked till just firm on the outside, and then sliced into the familiar biscotti shape and then baked again. I’m not sure why this is so. Is it because biscotti is meant to be a long-lasting, storage food? The one thing that I’m not so crazy about this recipe is the strong eggy taste. It might not be so discernible if you weren’t looking out for it, but it was strange to me. The exclusion of any fat whatsoever necessitates the additional eggs, so I think it would be inherent to any biscotti recipe, unless you get a bastardized American version that’s softer and chewier. 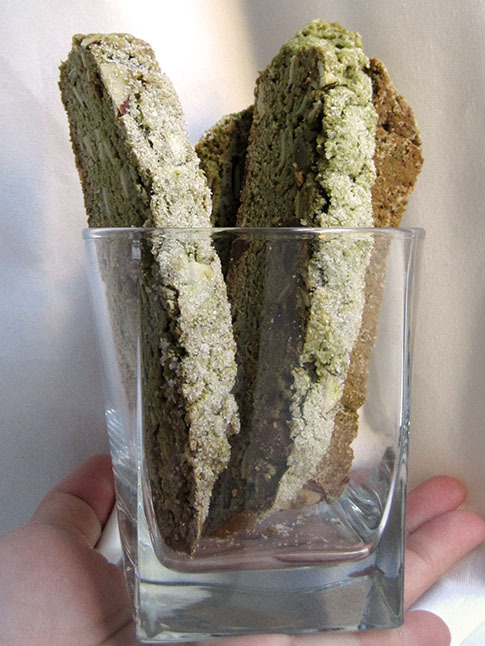 Nevertheless, this biscotti is great to dip into a hot cup of tea and munch on. 1. Preheat the oven to 350 degrees and place the rack in the middle of the oven. 2. In a large flat bottomed bowl, whisk together the flour, sugar, baking powder, salt, and matcha powder. 3. In a smaller bowl, whisk together the eggs and vanilla extract. 4. With a rubber spatula, stir the egg mixture into the flour mixture until the dough just starts to come together. Dust your hands with flour and knead the dough in the bowl until all the ingredients are incorporated and the dough is tacky. 5. Add the crystallized ginger and almonds, and knead the dough until incorporated, about 10 to 20 times. 6. Separate the dough in half. Form two logs, approximately 3 inches wide and 1 inch high on a parchment lined baking sheet. Leave several inches between the logs, the dough will spread as it bakes. Press the top of each log with granulated sugar. 7. Bake in a preheated 350 degree oven for 30 minutes, or until the tops begin to crack or split. Transfer logs to a wire cooling rack to cool completely. 8. Transfer biscotti logs to a cutting board. Slice the biscotti on a diagonal and place cut side down on the same parchment lined baking sheet. 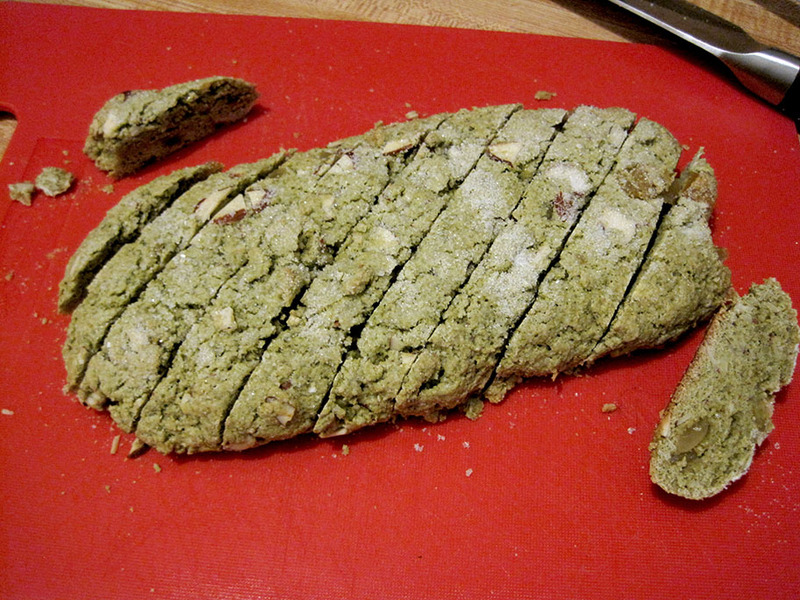 Bake for an additional 20 minutes, turning the biscotti once halfway through. Transfer to a wire rack and let cool completely.